The last 12 months have been a transformation period for Microsoft and its Partners. However, in the following year, transformation activities may gain momentum. The 2018 Inspire conference that took place during 5 -19 July, 2018 in Las Vegas opened the door to innovation, growth and the more specialized development of Microsoft partners. Companies worldwide are undergoing deep transitional processes stimulated by the cloud, artificial intelligence, augmented reality and the Internet of Things. Microsoft’s partner ecosystem encompasses hundreds of thousands of companies that have a global impact on the success of enterprises and public institutions. By implementing business applications and industry solutions, these organizations become a real part of the Microsoft team dedicated to the provision of innovative technologies to millions of users. Microsoft Inspire is an annual event organized by Microsoft for its partners. This year’s meeting was focused on new opportunities that will enable partners and business entrepreneurs to take business to higher levels thanks to modern Microsoft technology and services. 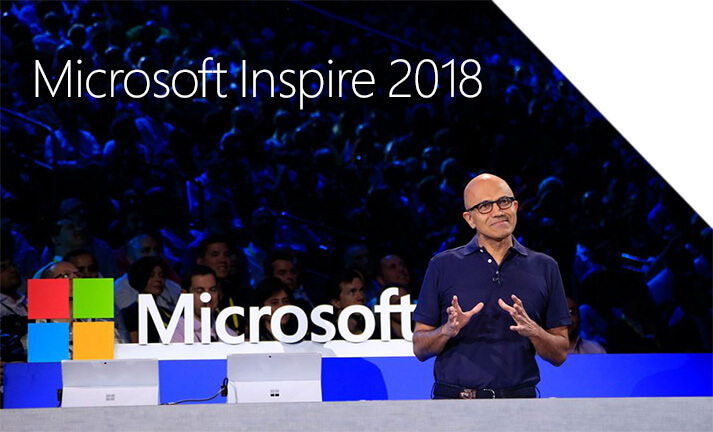 During Inspire 2018, Microsoft emphasized its dedication to creating new jobs, business applications, infrastructure and artificial intelligence. Satya Nadella presented the huge scale of the global Azure infrastructure deployed and available in 54 regions and 140 countries. Only Microsoft can present such a spectacular result. Satya Nadella also indicated organizations which have decided to implement solutions based on Azure, Azure Stack, Azure Sphere, Azure IoT or Microsoft 365. These organizations included McDonald’s, Walmart, Toyota, Walt Disney and Heathrow Airport. “The complete dominance of the cloud is expected within 3 to 5 years. However, sales plans for Central and Eastern Europe clearly indicated the tendency to maintain fixed sales of the on premise version, accompanied by big growth dynamism in the sales of cloud-based solutions for at least the three next years” – says Piotr Śledź, the President of the Board, IT.integro. 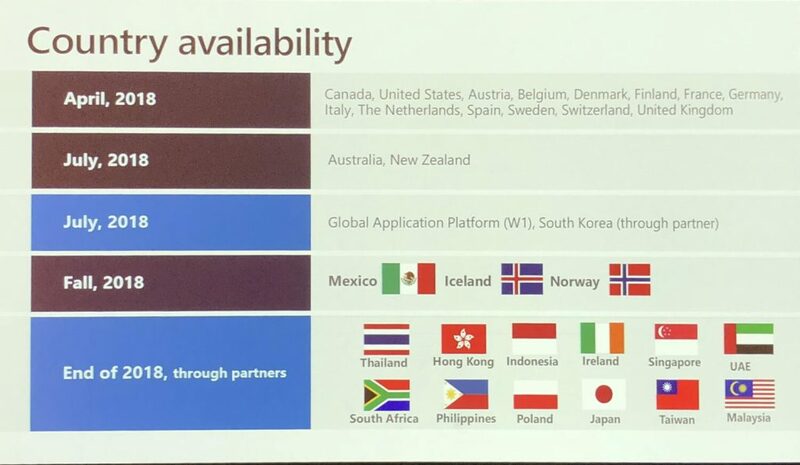 During the event, Microsoft presented summary conclusions for the first year of the Microsoft 365 package availability. Among other things, Microsoft informed that there had been a 100% increase in jobs, including 135 000 commercial users of Office 365 (per month), 200 million active commercial devices with Windows 10, and over 65 millions jobs in Enterprise Mobility and Security. The premier of the Polish version of Dynamics 365 Business Central on-cloud has been planned for the end of the year. As we have announced before, the new Microsoft Dynamics NAV version – Dynamics 365 Business Central on premise is to become globally available this autumn. The global premier of the cloud version took place in April 2018. Dynamics 365 Business Central on-cloud is already available in 14 countries – the USA, Canada, Great Britain, Denmark, Holland, German, Spain, Italy, France, Austria, Switzerland, Belgium, Sweden and Finland. Starting from July 1, 2018 the solution can also be purchased in Australia, New Zealand and South Korea, and in autumn it will also be offered in Mexico, Island and Norway. Microsoft has invited its leading partners to collaborate on creating a plan for the localization of the on-cloud system version for selected countries. The partners will be responsible for customizing Dynamics 365 Business Central in accordance with local requirements. This collaboration will ensure that by the end of 2018 the system will be available in Thailand, Hong Kong, Indonesia, Ireland, Singapore, the United Arab Emirates, Republic of South Africa, Philippines, Japan, Taiwan, Malaysia and Poland where IT.integro is to customize the system to Polish requirements. Polish Functionality for Dynamics 365 Business Central on premise will appear on the market a few months after the global launch that is in the first quarter of 2019. Microsoft proposed new support programs for its partners, both software and service providers. The programs are aimed at helping partners provide more customer-oriented optimized solutions and ensuring the successful launch of the solution onto the market. Microsoft empowers partners with tools that will enable them to generate more leads among small and medium-sized companies, corporations, end customers and state and educational institutions. When presenting apps and services Microsoft showed the new capabilities offered within the Microsoft 365 package, including free Teams service, new event management functionalities as well as analytic tools for teamwork. In addition, Microsoft announced the availability of the latest cloud-based and data management solutions, including: Azure Data Box Disk, Azure Virtual WAN, Azure Firewall. Microsoft highlighted enhanced consulting services and new solutions for partner collaboration (partner-to-partner solutions), that will enable organizations to create a common offer available through the AppSource market. During the conference, partners were encouraged to specialize in and focus on selected services and products. As research conducted among Microsoft partners shows, the growth of partner business is highly dependent on specialization. The new competence program called Azure Expert Managed Services Provider is to provide partners with opportunities to use their expert knowledge to meet business challenges At the end of the year, partners will be provided with a package of benefits tailored to their business profile, including the lead generation. While talking to the 16 000-partner audience at Inspire, Satya Nadella, CEO Microsoft, presented the future plans, prioritizing partners’ needs. He also indicated new growth opportunities Microsoft creates for its partners. According to Nadella, when looking into the future, partners will have much more capabilities to serve their customers in the era of Intelligent Cloud and Intelligent Edge. Compared to the previous models such as client-server, web, mobile and cloud, in the future partners will gain a much deeper understanding of customer needs”.